Been using for the last few years and it works very well,something that's important 4me is to save all my emails to a file that I choose. I have used many email apps over the years but it always seems at some point they discontinue them. I hope this is not the fate of "ThunderChicken" cuz I have really come to like it very much, in my opinion its a very good email service that does all I want and more. Thanks Mozilla. Not a big deal but that screenshot really needs an update. It doesn't do the TB interface justice on newer OSs/themes. Yeah, I didn't really mean revert the entry. I meant those that rely on new messages being checked at a specific interval and those that use sleep (like I do) should revert to v38.1 until Mozilla sorts this bug out. freakazoid: Good catch but since the issue only affects coming out of hibernation and the workaround is reasonable (restating the client), I think I'm okay leaving the entry as-is. That would be a bug due to updates to the internal updater. It will be handled in the next release. It's usually best to report it directly to the publisher so it can be fixed faster. Joe: Yeah I'm getting that too, but I think that's caused by a plugin on my side. I can't speak to the native client. It creates a folder in AppData\Local\Thunderbird with another empty folder inside name thunderbird. hamasaki: How did you update it? I've been getting auto-updates for a few years now without issue. As it becoming the norm now, after upgrading lightning stopped working. The cause this time was the location paths all became corrupt. The fix was to adjust them in the prefs.js file. 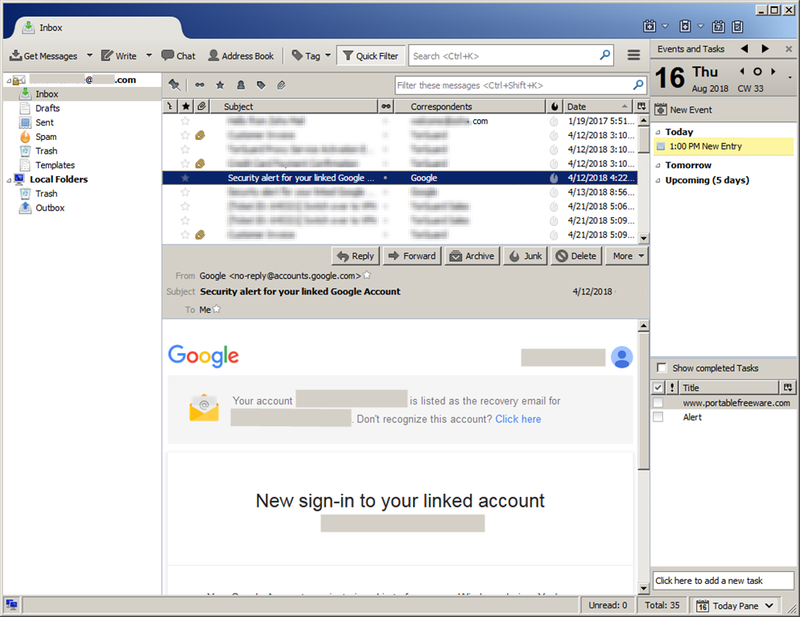 After using a really, older version of Thunderbird, I decided to try out the latest version and I'm loving it. This new version of Thunderbird is great. The level of customization is akin to Firefox. IRC / IM support is now built-in. I actually prefer using the combo of Firefox / Thunderbird than using Seamonkey. I give up on Thunderbird !!! I have found Dreammail to be a much better substitute with built in backups,there is a lack of english help and or a forum.but its a pretty basic setup..
Tb ate my mail this week and then died. Er...so I gave up on it, forever, regardless of backups. Tb ate my mail last week and then died. Er...so I re-installed it and copied over - no problem. If its important, back it up. D-synchronize (portable) and FreeFileSynch keeps my sh*t together accross many laptops + more flashdrives + several usb H/Ds. I'm sorry for some "Typo" in my previous post! The Link to X-Thunderbird is still Pointing to the OLD 2.0.0.23 version. Thanks Nick, I'll give it a shot. @freakazoid, Tools > Account Settings > Synchronization and Storage, uncheck "Keep messages for this account on this computer"
It synchronizes alll your IMAP mail; I had like a 500MB Thunderbird install afterwards! I'll give it some more time before I try it again. Love Thunderbird, but the portable version is crapware. I've lost everything off of three different flash drives within 8 months, and all unrecoverable. I have pressed the "Update" button (unfortunately didn't unchecked the option for checking for updates), so Thunderbird Portable 2.0.0.16 update itself to Thunderbird 3-and-who-knows-which-version. Result: All my accounts with messages went out, all the settings gone, it cannot remember my passwords any more, it do not give me an option to use password manager to remember password, so I have to put passwords every time I start Thunderbird. I could say that it destroyed himself. Other thing: it could import settings and address books from other email clients, except from itself (it is an instruction on Mozilla Knowledge Base, but you could see on forums that it not works at all! Neither the password remembering workaround. So, my experience tells that Thunderbird is an amazing software until it works. It has plenty of excellent options, but you could anytime loose your setup and data. After you recover them, it will be the shadow of the previous Thunderbird: lot of bugs will force you to choose another email software. And, for the end: There are lots of complains posted to forums, but no one answered, it seems that Mozilla crew do not care! Why is this still at version 2? As development releases slow down, I hope Mozilla doesn't end development for Thunderbird. Lost it All. Address books, emails, account Setups. ALL gone and I do not have way to recover all that data. Two weeks worth of work GONE. I was trying to save a copy in Backup; when I open all was empty. I am in shock. I never lost so much data. Hi Can i make thunderbird portable with .xml file like filezilla? I'm also having problems sending [see comments by Anders Martinson]. What's the answer? Any ideas? Would one of these versions be better than the other? I tried the x-thunderbird and it seems to take loads of memory. Is it the same with the portable apps version? Does anybody have had problems sending messages with Thunderbird portable? Getting message: connection to SMTP server failed. Server may be unavailable or is refusing SMTP connections. All settings are correct in my Thunderbird and according to e-mail suppliers instructions. SMTP-server is available. Could it be a firewall problem? About the hang with attachments: this has been discussed on the portableapps.com TB forum. It turns out that deleting mimeTypes.rdf in the TB profile eliminates the hang. Thunderbird Portable V2.0.0.18 nows hangs whenever I try to download a message with an attachment (in some IMAP account). The OS is windows Vista SP1. I downloaded and tried 'Thunderbird' a couple of years ago, (i'm not sure if there was a portable version then), but i couldn't make it work so i scrapped it. I'm now using 'Thunderbird Portable v2.0.0.18' both on my PC and on my external hard drive. I have 8 'accounts' set up on it and find it easier to set up and use than 'Micro$oft Outlook or Outlook Express'. I've got a little program called 'Abakt' set up and use that to do regular backups of 'Thunderbird' but so far i haven't had any problems with data loss, (touchwood). With all these sort of programs it's VERY important to set up a 'Disaster Recovery Plan', (for those of you who aren't computer literate, it's simply a procedure of what you can do to limit the loss of data, software etc if there is a disaster). I Want a tray minimizer in Mozilla, Please please please! After reading about official firefox I finally made my firefox portable and it is much better than the portableapps version which actually destroyed itself on my usb. But anyway, 1) what is the situation of Thunderbird's unicode support, has it got better considering the entry is a bit old. 2) is there anything like official thunderbird just like official firefox? it would really help you know. enigmail can be installed like any extension. and gpg is on the thunderbird portable homepage as an add-on. mobility email is a dead project and should be removed. I hope in the feature the enigmail will be again included! However, I have lost all data twice within the short period of 1 1/2 month.. Ans since I am not a programmmer, the explanations to try to recover it are far too advanced for me. And I cannot have an e-mail client that keeps deleting all my folders and messages!! The link provided also gives you the option of downloading thunderbird with Enigmail (which provides secure email [PGP/GPG] capability). Though its not as complete as the Mobility E-mail which claims to connect with Webmail services. The interface and themes is good. Not show size of attachments (must install extention for this plan option), no options for Export Accounts, Address Book, Email (maybe, the MozBackup can help). After deleted some email and used option Compact Folders the folders size is too large. Pros: Relaiable, has all you need almost like MS. outlook. Cons: Heavy, works slow, doesn't fully support Hebrew, latest version have some XML problems.